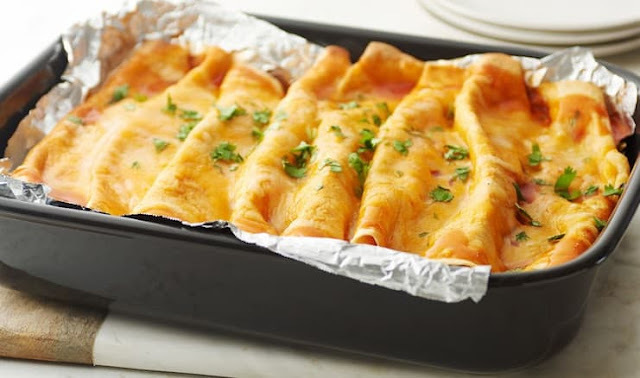 Chicken enchiladas are always a hit, but they aren't always the healthiest. This lower fat option utilizes whole grain tortillas, chicken breast, vegetable oil spread high in Omega-3 Fatty Acids, and fat free sour cream to keep things lean and mean. Much lower levels of saturated fat and trans fat in this recipe compared to more traditional ones. Enjoy this frugal fat-reduced feast that won't hurt your fitness! Preheat oven to 350 degrees. Thoroughly grease an 8×10 pan. Mix chicken breast, whole grain tortillas and low fat cheese. Pour into greased pan. Microwave water and bullion cubes for 1 minute 30 seconds, stirring halfway through. In a sauce pan, melt butter, stir in flour and cook 1 minute. Add bullion mixture and whisk until smooth. Heat over medium heat until thick and bubbly. Stir in sour cream, onions and bell peppers. Do not bring to boil! Pour over the chicken mixture and stir. Top with remaining cheese. Bake 25 minutes. Once done, sprinkle cheese over casserole and return to the oven. Turn off the oven and leave in until all the cheese is melted. If you want to brown the cheese, turn the oven to high broil for 3 minutes. Enjoy this epic meal filled with plentiful protein and fat-burning fiber! I hope you enjoyed this free healthy recipe for low fat chicken enchilada casseroles to eat like a king while paying less.